Anu is the Choir Director of The Reapers Choir. She writes, arranges and produces a number of their songs. However, her first love is to sing and she has been doing this for over two decades. She has sung with and for many different choirs, groups, solo artists including work with Lay Witnesses for Christ International, Pastor Jason Nelson (USA), Michael Bethany (USA), Carren Richards, Visual Ministries Choir, Re-Formed and The Sower Production Theatre Group. She has also ministered internationally including in the USA, Italy, Ghana, and Nigeria. She is trying to develop herself further by learning how to play the piano. 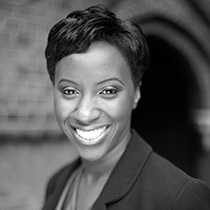 She is a lawyer (barrister) by profession and engages in mentoring work in the community.